The ruins of Serathis loom high in the mountains. Only recently uncovered, this ancient city draws many to its shattered streets in search of treasure and adventure. Giants and dragons square off on opposite sides of the ruins, each seeking to hold the city and its wealth. The winds of war howl in the distance. Vast wealth and terrible monsters await! 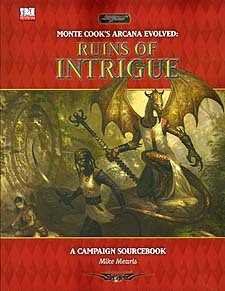 Ruins of Intrigue is an innovative approach to adventure creation. It provides a detailed, modular overview of Serathis. Major NPCs and locations have sets of optional secrets and variants, making every campaign different. A rich array of ideas, plots, and vying factions gives you varied ideas for creating adventures. Just pick a hook, choose a goal, select an obstacle, and you're ready to go. Suitable for Arcana Evolved characters of all levels. Requires the use of the Dungeons and Dragons Third Edition Core Books. Requires the use of Monte Cook's Arcana Evolved.